The portable utility wagon has become the standard in today’s busy world for getting from point A to point B without the burden of lugging along all of our stuff, and as modern day consumers, we have lots of stuff. With a wide range of utility wagons on the market, it important to take a close look at the features each has to offer, to choose one that will meet your specific needs. This article will take an in-depth look at one of the popular choices for portable wagons, the Mac Sports Wagon. 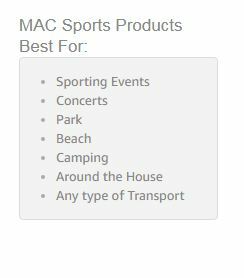 This review of the Mac Portable Sports Utility Wagon will evaluate specific product features, benefits, and critiques to see if this model meets the need of today’s portable wagon user, compared to similar models. Lightweight, making it useable for anybody in the family provides its carrying case. Durable fabric resistant to weather. Supports up to a 150lbs. Quality wheels. Simple to store and use. Deeper wheelbarrow to accommodate taller items. Folds to 8″ Sleek, compact design. Has two mesh cup holders. Wheels operate separately from handle, can make steering less fluid. Doesn’t have a canopy for shade. Has strong tire smell after original unpacking( goes away quickly with minimal airing out). 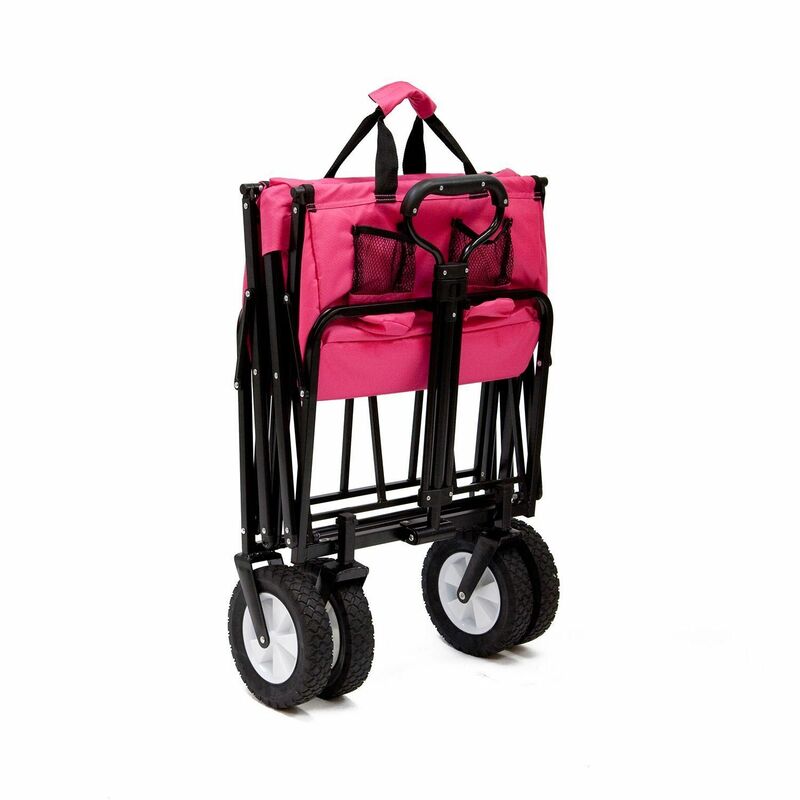 Can be too heavy to lift for people with arthritis or limited weight restrictions. Can be difficult to maneuver in softer sand. TheMac Sports Folding Utility Wagon has a durable canvas designed to benefit a wide range of needs. The polyester fabric is a 600 denier blend that provides resistance to wear and tear, making it suitable for transporting a wide variety of goods. The fabric is strong enough to handle sharp garden tools like clippers, trowels, and shovels without worrying about ripping or puncturing. The denier blend also is designed to provide ample support for heavier items, such as bags of fertilizer, soil, and bricks. Along with durability, the polyester fabric also provides a stain resistant canvas that is easy to clean. Polyester is designed to withstand the harsh outdoor elements like rain and snow without compromising its integrity. Polyester is more stain resistant than many other fabrics, so spills can be easily spot cleaned . The denier polyester fabric makes the Mac Sports Folding Utility Wagon a multi-functional tool that has limitless uses, whether it be in the garden, camping in the woods, or providing luxury at the beach. The Mac Portable Wagon is supported by a sturdy stainless steel frame. This feature provides benefit to anyone who plans on using it for heavy items. The Mac sports Wagon can support up to 150 lbs, making it useful for more labor intense-jobs, such as moving lumber on job sites or toting heavy equipment for team sports. The stainless steel frame also allows for transportation, without being damaged from being packed tightly in the trunk. The frame also prevents accidental collapsing during use, making it safe to transport heavy, but delicate items. Mac wagon accessories are very long-lasting too. The Mac Sports Collapsible Wagon has an improved handle design in comparison with other models. The handle itself is adjustable to two different lengths; this adds benefit by allowing comfort for more than one user. The Mac Sports Collapsible Wagon extends for people who need a longer reach, and also retracts to a shorter length allowing for use by mom, dad, or even the kids. In addition to the handle’s retraction feature, it also comes with a latch to hold it in place. This is something that makes storage easier because you don’t have to worry about it falling loose in your trunk and getting bent or broken. The absolute most important factor to research when buying a portable wagon, is how easy it is to bring with you. Being portable is its primary function, so it must make that an easy task for the buyer. The Mac Portable Wagon comes with a carrying case to pack up neatly for storage in the trunk or closet. I find this feature is helpful to make carrying it in its compacted form simple. The wagon itself only weighs around 26 pounds, so it should be light enough for most users. The floor of the wagon has a latch to pull it closed quickly, without having to disassemble it. What separates this model from other brands, like the Ozark trail Wagon is that it folds into a more compatible form measuring at 8″ thick. The design of the Mac Portable Wagon is flatter and sleeker, making it easier to fit into tight spaces. The wheels on the Mac Utility Sports Wagon have shown to hold up better than some of the other models. Reviews on the product itself highlighted the quality of the wheels for being able to withstand heavy use without falling off. The wheels also fold up neatly, which I like because I don’t have to worry about packed in the trunk. The wheels of the Mac sports folding utility Wagon are comparable to other wagons regarding terrains it can successfully be used on, including sand, grass, gravel, and even rougher terrains. Another, less obvious benefit of the Mac Wagon is the depth of the wheelbarrow. The depth of the wagon is almost double that of similar products. This feature adds the freedom to move taller items without worry of it tipping. The depth allows for better center of gravity, so bungee cords aren’t needed with this product to secure them. The design of the wagon floor provides flexible support, so removing an additional piece to ensure the floor isn’t necessary. The Mac sports utility Wagon comes ready to use right out of the box. Assembly is not required. The functional but simple design allows for utilization and storage by anybody. Many reviewers looking for a reliable transit of heavy loads have used this wagon for moving boxes during a big move, moving tools around on job sites, and for more efficient means of stocking inventory. 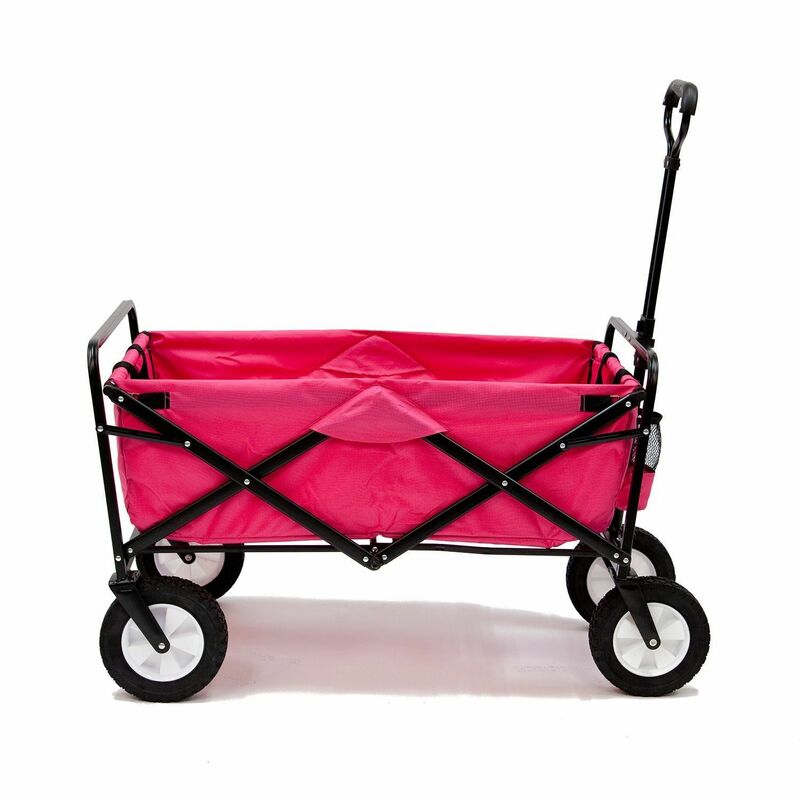 The wagon’s durable canvas also provides use in outdoor extremities during gardening, camping, and fishing. Its lightweight design makes this perfect for getting groceries in the house more manageable, or for vendors who need a convenient way to set-up shop at flea markets. Q: Is the canvas removable for use in a washing machine? A: No, but it is easily cleaned with spot treating as needed with water or mild detergent. Q: Does this include a canopy? A: No, but one can easily be attached. Q: How well does it move in the sand? A: It can easily be pulled in the sand, but the more weight added to the cart will cause more resistance, especially in softer sand. 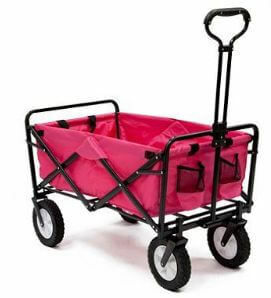 Q: Can you describe the shade of pink this wagon comes in since pictures can vary? A: The Pink Mac Wagon is a darker shade of pink, close to hot pink. Q: Can kids and pets ride in the wagon? A: Although the Mac Sports Wagon provides ample support and room to accommodate kids and pets, doing so would be at the users own risk. The Mac Sports Utility Wagon offers its share of simplistic benefits at an affordable cost. This product is similar to many others on the market, but with a few specific features to make it stand out. 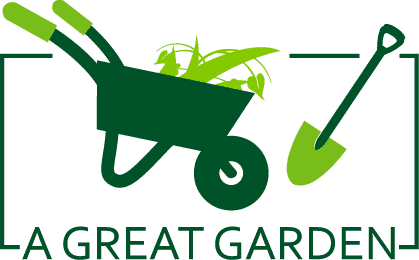 Reasons I believe it is worth recommending include the deeper wheelbarrow and higher quality wheels. Small features like this are important for choosing a product that will be satisfactory over an extended period. This wagon also provides the benefit of easy storage, with no additional pieces to disassemble or store. Loose steering aside, the Mac sports Wagon offers a valuable, multi-purpose solution to any buyer looking for an easier way to travel at a moderate price.